Michelle Darrah is a native to Panama City, Florida where she started her schooling at Rollins College. She spent a semester at the Biosphere 2 in Arizona courtesy of Columbia University to study astrophysics in a hands-on environment. Afterwards she returned to Rollins for an interim semester until she could find a school more suited to her studies, which is how she came to be a student of UH Hilo. 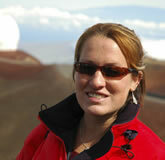 Now at the base of Mauna Kea she is pursuing her undergraduate degree in astronomy/physics and plans to graduate in May of 2006. As the data from a telescope become more accurate, the science learned from that data is more accurate, and better detailed. Every time a telescope “sees light”, from its first to its one thousandth, the telescopes and the instruments being used on them must be calibrated to assure its accuracy. There has to be some well known and well documented data about an object that the incoming data can be compared to and corrections can be made. In the submillimeter wavelengths, quasars are the best calibration objects. This project is to assist in the data collection and reduction of quasars to be published in two lists so as to be referenced by other submillimeter telescopes for calibration. Quasars that have good quality data spanning over a time period of at least six months are candidates for the lists. Working with data from the SubMillimeter Array (SMA) on Mauna Kea, and crossreferencing it with data from the Very Large Array (VLA) in Socorro, New Mexico, the quasars will be separated into those with a minimal variability of flux, excellent for calibrating the telescopes, and those with a maximum variability, for their intrinsic scientific interest, but unreliable for amplitude calibrations. The data is collected from the SMA and then reduced using MIR data reduction software. The VLA crossreferencing is to check for abnormalities in the flux at other wavelengths. If the flux variability is below a certain percent (to be determined), it is considered stable and “uninteresting” and a good candidate for fine tuning. If the variability exceeds this percentage, it is “interesting” and a good candidate for range checks and stability for a short period of time while the source stability is confirmed. With these two lists being published together, current and future telescopes can calibrate their telescopes and instruments faster and more precisely so that the quality of their received data will improve. Improved accuracy of the telescope leads to improved quality of data leading to better science and more knowledge.